Today, I am happy to announce the re-release of The Girl and the Clockwork Cat, Clockwork Enterprises book one, in print and eBook editions. After much consideration, I decided to part ways with the original publisher, so now, with some errors corrected, it is back out and ready for the world. But where is Clockwork Enterprises book three? This has been a year of many changes for me. It started early in the year with the end of my marriage. I believe, based on the ways we both have changed, that this will be better for both of us in the long run. Believing that didn't make it easy to walk away from the life I had known for so many years. I moved into my own place and got a new day job while trying to keep up with writing and promoting my books. I have been rebuilding my life and that has taken the majority of my focus this year. In the midst of all this change, I have managed to release Apostate, the final book in the Forbidden Things series, and The Keeper, the first book in The Endless Chronicles, as well as the audiobook edition of The Girl and the Clockwork Cat with the audiobook for book two in that series coming out soon. I also got the rights back for The Girl and the Clockwork Cat print and eBook editions that I released today. One of the unfortunate victims of all of this is the third book in the Clockwork Enterprises series, which I had planned to release in September 2016. I am happy to say that it is progressing and I do hope to have it out by early next year at the latest. I apologize to any of the fans who have been waiting on this release. I will get it out soon, but will take the time necessary to make sure it is worthy of the time you put into reading it. Please bear with me. When I look back at all I have accomplished over the year and all the incredibly hard things I have made it through, one thing stands out above all else. I didn't do it alone. I had an amazing group of people who stood by me, even when I was at my lowest and probably not that fun to be around, and helped me move forward. So, for everyone who, like me, has found it hard to get out of bed, hard to smile, hard to breathe, remember, this is when we need each other most. This is when we need to reach out to each other and come together. We are not alone and that is our power. 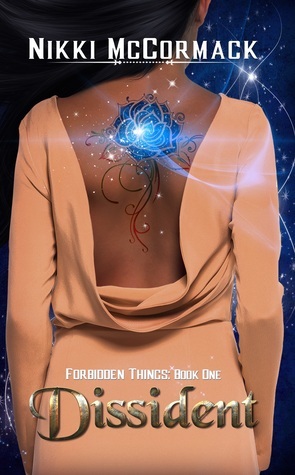 Forbidden Things Series Tour and Giveaway! The Forbidden Things series is on tour with a $25 Amazon or Barnes and Noble gift card giveaway July 18th through the 22nd. Visit the stops below to join the fun and enter the giveaway! Official Release! Apostate (Forbidden Things book 3)! I'm very excited to announce the official release of Apostate, the final book in my Forbidden Things series. Visit the Apostate page to read the first chapter and find links to order. Also, keep an eye out this week for free promotions on my short stories, In Silence Waiting and Making Monsters, and a Kindle Countdown Deal running the 20th through the 27th on Dissident, Forbidden Things book one. Apostate (Forbidden Things #3) cover reveal! In spite of an extraordinary amount of crazy in my 2016 so far, I'm excited to share with you the cover art for the upcoming third book in my Forbidden Things epic fantasy series! Before I show you this newest fantastic cover by Raquel Neira, however, here is the list of great blogs that are also hosting the cover reveal arranged by Masquerade Book Tours. Now, here is the cover for Forbidden Things book three, Apostate! In a lot of ways, 2015 was a hard year for me. There were some health scares with people close to me. I spent a large part of the year dealing with prolonged injury recovery for my horse and adjusting to live in the city after 14 years living in the country. I have also spent the last several months handling my own injury recovery thanks to my dog, Teagan (I love him, really I do) feeling it necessary to leave his bone on the top step in the middle of the night. On the up side, I started 2015 with the lofty goal of getting another book published. I ended the year with three more books released into the wild. Dissident (Forbidden Things #1), The Girl and the Clockwork Conspiracy (Clockwork Enterprises #2), and Exile (Forbidden Things #2) have all joined my debut novel, The Girl and the Clockwork Cat, out in the world. In 2016, I'm planning the released of the next two books in both series along with the introduction of something new that I'm very excited about. To kick off the new year, I'm taking Exile on a virtual tour coordinated by Masquerade Book Tours. The stops are listed below. Join me and get involved for the glorious fun of it and for chance to win one of two $25 Amazon/Barnes & Noble gift cards. May your 2016 be amazing (and full of books)! Exile Release and Other Happy News! As I was sitting down to write this blog post, I got a bit of happy news. My young adult novel, The Girl and the Clockwork Cat (the first book in the Clockwork Enterprises series), made the finalist list for the Dante Rossetti Awards. They're still judging for First in Category and Grand Prize. Congratulations to all the other finalists. Now to the announcement of the official release of Exile, the second book in the Forbidden Things series. For links to order and a look at the first chapter, visit the Exile book page. Stay tuned for the blog tour January 4th through 8th, hosted by Masquerade Book Tours. Tis the season for being thankful, so I'd like to express a great deal of thanks to my cover artist, Raquel Neira, for producing yet another fantastic cover for me. Exile is the second book in the Forbidden Things series, scheduled to come out in December (the season of giving - *wink*). The fantastic folks at Masquerade Book Tours are hosting this tour. Stops are listed lower down, just above the amazing cover reveal! Before I reveal the cover, if anyone is in the Portland area the 20th through the 22nd, I'll be down there with my books at OryCon at the Waterfront Portland Marriott Hotel. Feel free to come by and say hello. It's finally here! The long awaited sequel to The Girl and the Clockwork Cat! Visit The Girl and the Clockwork Conspiracy at Elysium Books for the first chapter and links to order. If you're in the Seattle area, come join me at Steamposium on Friday, September 25th at 4 p.m. for a public reading. I'll also be there all weekend signing books. Maeko hasn't been long away from the gritty London streets and she's already learning that her new “civilized” life comes with its own challenges. She has to dress proper, eat proper and be a proper lady. She can’t even talk to a boy without a chaperone. She's got proper coming out of her ears. If not for her feline companion Macak, she might go mad. Her one hope for some freedom and excitement comes when the moody detective, Em, asks her to be an apprentice. But that apprenticeship comes with a price. She must agree to spy on Macak’s owner, Lucian, the wealthy businessman and inventor whose life she saved. Everything changes when Lucian's brother dies in an explosion while visiting Lucian’s home in the heart of London. The Literati—a powerful group vying for political control of London—say it was murder and Maeko is on their suspect list. With Macak at her side, she must turn once more to her allies, Chaff and Ash. They will have to brave city streets torn by rebellion and conspiracy to find the truth. With all the craziness around getting The Girl and the Clockwork Conspiracy (book two in the Clockwork Enterprises series) ready for publication before Steamposium, there hasn't been time to set up fancy cover reveals and such, so I'm doing a little under-advertised cover reveal of my own for you here today. If the rest goes according to plan, the book will be available in print and ebook on September 14th. I will be signing copies of the first two Clockwork Enterprises books and doing a reading from both at Steamposium, September 25th through the 27th at Seattle’s waterfront Bell Harbor International conference center. Come join me if you're in the Seattle area. Copies of Forbidden Things: Dissident will also be available for purchase. Once again, I must give thanks to my excellent cover artist Raquel Neira, and also to Michael McCormack for his photography, Ann Forseth of Romany Rapture for the lovely jacket on the model, and my cat Neko for his fantastic modelling work. The previous giveaway has ended and I'm still deep in edits on Exile and Apostate (Forbidden Things 2 & 3) and finalizing details for the release of The Girl and the Clockwork Conspiracy (Clockwork Enterprises 2) next month. Needless to say, original blog content has suffered. I'm hoping to get some new content up soon. In the meantime, I offer you another giveaway. Giveaway ends August 22, 2015.